Lift it with confidence. Every lift needs the most careful management, and the most complex lifts demand the support of highly practised engineering skills. Don't risk safety or efficiency. Use our qualified heavy lift engineer to plan your next lift. Ground conditions and crane supports are correct and capable of holding the point loading. Cranes to be used are of the correct size and ideal configuration. Lift points or spreaders are of the correct specification and capacity. Rigging is certified and of the correct capacity and configuration. Load weights and centre of gravity is correctly specified or calculated. Multi-crane lifts are setup correctly and cater for even weight distribution or weight distribution ideally suited for the crane configurations. Logistics of the lift and plant are planned and catered for. Lift procedures are put in place. Health & Safety priorities are met. Before your next big lift consider. Have I considered all the factors involved? Can I see all that is required? Can the crane company I'm using see all that is required? From our experience, many cannot and their incident register often reflects this. Get your lift right. 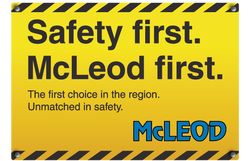 For engineering planning on your next lift contact McLeod Cranes. Crane hire companies are not required to have any qualified staff. Surprised? At McLeod, we take a radically different view. We emphasise continuous training among all of our people. But if you're involved in crane selection and hiring, you need to know the position. The Code of Practice for Cranes pushes for two NZQA unit standards to be held, but this is only a guideline. The NZQA Crane Operators Certificate is only a small step further covering category one lifts or simple basic lifts. Category Two lifts require engineering planning and procedures. Category One: relatively simple basic lift requiring two or more cranes. Relatively routine, simple basic lifts not involving significant height or reach using two or more cranes. A simple routine, basic lift is normally one which because of weight, length or physical size requires two cranes e.g. lifting a 40ft container from each end off a truck and placing it on the ground. For your next Category Two lift or for independent, sound advice on your next lift, get expert guidance. Contact us. We're here to take the load off your shoulders. We'll ensure your lift goes smoothly and you have the right engineering in place for the cranes in use.